rock hill missouri - B.E.L.T. I just received the greatest Valentine in the mail, which begins with “You’re unmatched in my book,” and ends with two vintage matchbooks. One of them is above, for the Great Central Lumber Company in Rock Hill, MO. And look at the building drawing on the right! 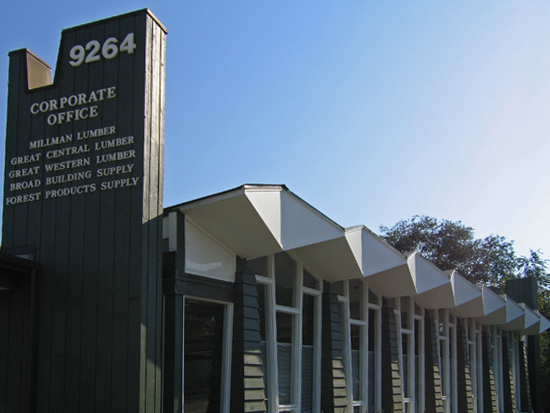 The building still stands to this day, and Great Central Lumber remains, now as one of several tenants. I’ve always admired this building, and it seems the original owners did, as well, making the effort to put a line drawing of it on their promotional matches. Can you think of any recent new buildings that are matchbook-worthy? And will matchbooks one day be a thing of the past? It first went up in 1966, and it’s shocking that it’s survived that stretch of Manchester Road for this long, in such unscathed condition. Because the other Valentine’s matchbook* is for a drive-in that no longer exists in either of its locations. 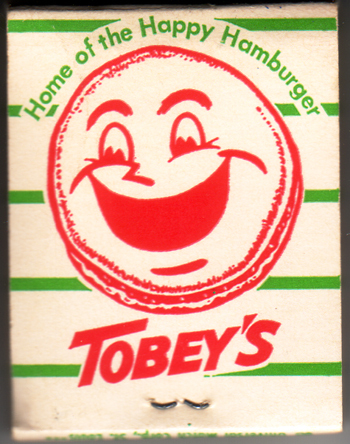 Tobey’s Drive-In, “Home of the Happy Hamburger” lists 2 locations inside the matchbook cover: 9600 Highway 66 in Crestwood, MO and 9315 Manchester Road in Rock Hill, MO. The Rock Hill Tobey’s was basically across the street from Great Central Lumber, and since 1999 there has been a god-awful ugly apartment complex on the land where the drive-in once was. The Crestwood Tobey’s was at 9600 Watson, and Plastic Football has the scoop on the building St. Louis County records say is from 1973. So this building nerd is having a good Valentine’s Day. And Happy Valentine’s to you, too! 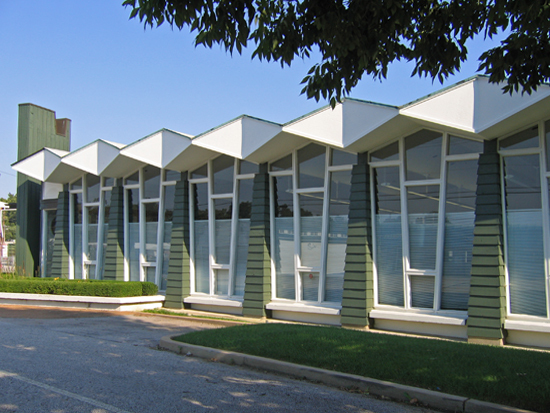 * It was manufactured by the Universal Match Corporation, St. Louis, another mid-century modern building that was demolished in 2010. Aside from losing a handsome building, it was also the long-time employer of a relative-by-marriage, who used to give me complete sets of matchbook series he helped produce. I especially remember a choice Bicentennial collection that helped me with my history homework far more than the school books did! “The building that was Tobey’s still stands. 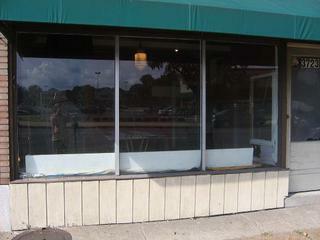 It became Steak n Shake and is now Reid Vann (9331 Manchester). My dad and uncles built it many years ago (1980) and it originally had a zig zag type roof, very similar to the one on the walkway at McGrath Elementary, corner of Litzsinger and St. Clair. When Steak n Shake took over the Rock Hill store they remodeled extensively to fit the corporate image and removed the roof. 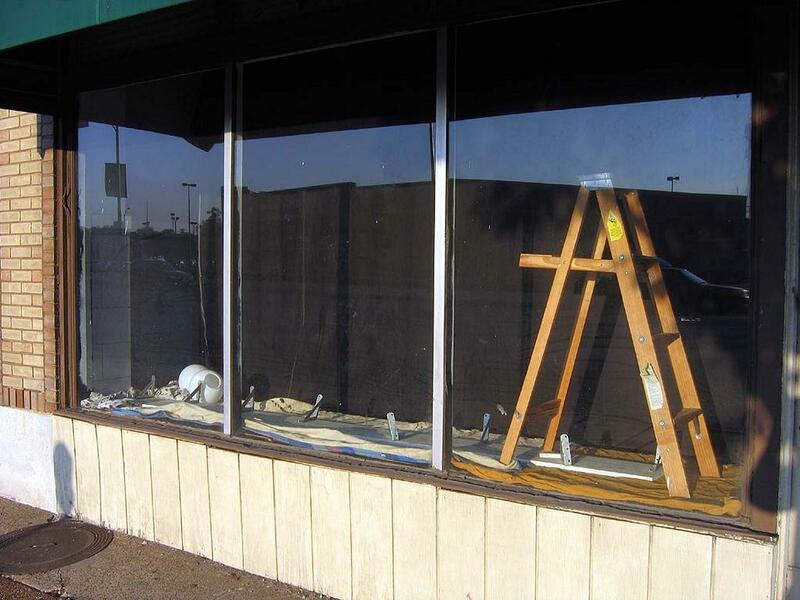 On Tuesday, October 18th, Billy Idol disappeared from the window, and excitement brewed within when I saw signs of renovation (above). I saw lamp shades; will Kabbaz add lighting to the Marilyn Gallery? I looked forward to the revamped unveiling of a new Marilyn. The black curtain backdrop has fallen to reveal freshly painted red walls, light fixtures, tables, chairs and a man busy on a ladder. Someone has taken over the storefront. That’s not surprising. 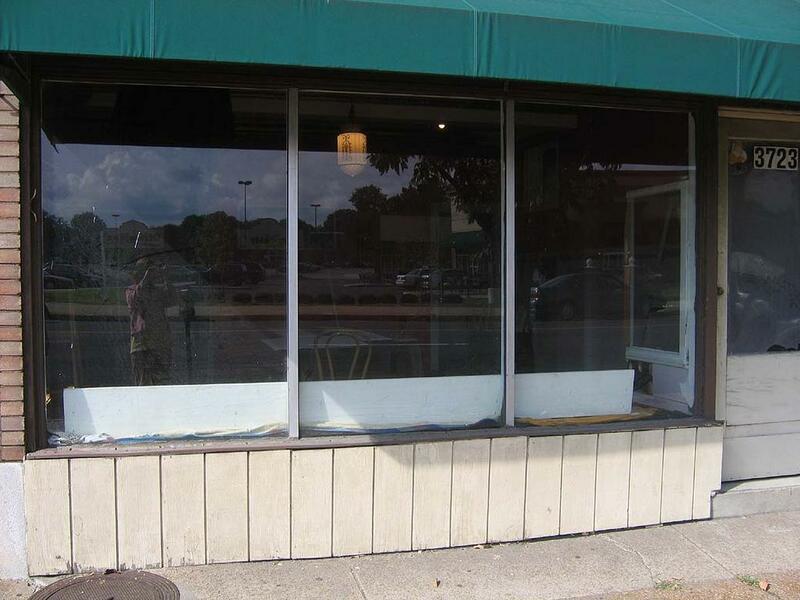 With major new retail across the street, these old storefronts are now desirable property. If I could sit in the Starbucks’ drive-thru and stare at Marilyn paintings, it would make sense for a business to take advantage of that kind of visability. I should have knocked on the door to pepper the Ladder Man with questions, but I was too sad and too shocked to do so. I walked away with a funeral dirge in my head and a heavy heart. So was Billy Idol’s rebel yell Kabbaz’s comment on being evicted? Will a new shrine spot be found? How do I mend my broken heart? With more bad news, of course. Today I got word that this Lustron home that I toured in June was demolished on October 18th. Details coming as soon as my anger subsides. And since my little BELT world was taking so many hits on this Sunday, I decided to really wallow in despair and view the last bits of the Northland carcass. An update is coming soon. …if I adore it, it’s coming down. It’s not paranoia, just fact. See the building above? It’s always been a glamorous favorite of mine, so of course it’s coming down any day now. The intersection of Rock Hill & Manchester is getting a massive makeover, so this gorgeous example of roadside jet set Route 66 architecture is toast. I’ll cover this story in greater photographic detail in the near future. But right now, I’m too sad and angry to care. Marking the 10-Year Anniversary of B.E.L.T. steve o'brien on A Kirkwood Teardown Courtesy of Nuns?